7401. “Death Notices,” Chester Lee Parsons, The Tennessean, Nashville, TN, December 29, 1976, 8. 7402. “Obituaries,” Martha Cofer, South Florida Sun Sentinel, Fort Lauderdale, FL, July 27, 1997, 31. COVER—Martha, 86 of North Miami Beach, FL died July 25, 1997. Robert Greaver Funeral Home, Hallandale. Felicitas Liselotte (Lilo) Cofer, 88, was called home on November 21, 2016, in Chula Vista, California. Lilo will be laid to rest at 10 am on December 7th in Glen Abbey Memorial Park, 3838 Bonita Road, Bonita, California. Her graveside service will be officiated by minister Rick Rojas. Lilo was born in Gelsenkirchen, Germany to Agnes and Erich von Pallasch on January 7, 1928. For many years she thrived as a model in Paris and San Francisco where she then met and married George William (Bill) Cofer on February11, 1952. For 20 years, she provided loving homes in many states and countries in support of her U.S. Navy husband. With her smiling eyes and busy hands, she unselfishly volunteered for 29 years at the Naval Medical Center San Diego. Lilo is survived by her husband Bill, her precious poodle Honey, and hundreds of friends she considered family. The family wishes to extend our sincerest appreciation to the physicians, nurses and hospital corpsmen that provided such kind, loving care. Lilo – we loved you more! Arrangements under the direction of Glen Abbey Mortuary, Bonita, CA. 7404. “Mary Lee Harden,” Find-A-Grave, https://www.findagrave.com/memorial/84484769, 84484769. 7405. “William Daniel Harden,” Find-A-Grave, https://www.findagrave.com/memorial/84484770, 84484770. 7406. “Death Notices,” William Daniel Harden, The Tennessean, Nashville, TN, July 1, 1945, 4. Funeral services for William Daniel Harden, 60, former Nashville resident who died Friday morning in Chicago of a heart attack, will be held tomorrow morning at 10:30 o’clock at the John C. Roesch and Company Funeral Home. The Rev. Boyd S. Fielder will officiate and burial will be in Gallatin Cemetery. Mr. Harden died after four years of failing health. A native of Lewisburg, he moved to Nashville as a boy and was educated in the city schools. He lived here, being engaged in the printing business, until 28 years ago when he moved to Chicago. There he was in the real estate business and operated operated an apartment house. In 1906 he married Miss Mary Lee of Nashville who survives. He was a member of the Methodist church. In addition to his wife, he is survived by a daughter, Miss Mary Lee Harden of Chicago; two sons, Dan Harden of Oradell, N. J., and Cpl. Ralph Harden of the army, now in Utah; three half-brothers, John, Joe and Robert Harden; four half-sisters, Mrs. E. E. Horan, Mrs. Carol Gower, Miss Elizabeth Gartner and Mrs. Emma Puryear; and an aunt, Mrs. Marshall Metz, all of Nashville. HARDEN—Friday morning at 9:30 o’clock in Chicago, Ill., William D. Harden. Survived by his wife, Mrs. Mary Lee Harden; daughter Miss Mary Lee Harden; sons, Dan of Oradell, N. J., Cpl. Ralph Harden, U. S. Army, Utah; aunt, Mrs. Marshall Metz of this city. Remains will arrive (Sunday) morning, July 1st, and be conveyed to the parlor of John C. Ooesch & Co., 1529 Broadway, where funeral services will be conducted Monday morning at 10:30 o’clock by Rev. Boyd S. Fielder. L. C. Holt. Charles Hardlng, Ben Mayo, Raymond Ellis, John L. Uhlian, Grady Ceick, B. B. Johnson, and Richard Smitha will serve as pallbearers. (Omit flowers.) Interment Gallatin Cemetery at 12:30 p.m., July 2nd. John C. Roesch & Co., funeral directors. 7407. William D Harden and Mary Adams Lee, “Tennessee, County Marriages, 1790-1950,” December 24, 1906, Davidson County, TN, Image 434, page 768 bottom entry, https://www.familysearch.org/ark:/61903/1:1:X8BK-KX1. 7408. Mary Lee Harden, “Illinois, Cook County, Birth Certificates, 1871-1940,” June 8, 1923, Chicago, Cook County, IL, https://www.familysearch.org/ark:/61903/1:1:Q23M-7SS4. 7409. Charles Nolan Harden, “Illinois, Cook County, Birth Certificates, 1871-1940,” June 1, 1918, Chicago, Cook County, IL, https://www.familysearch.org/ark:/61903/1:1:N7S6-YRJ. 7410. Alfred Raymond Rust and Clara Wilson, “Kentucky, County Marriages, 1797-1954,” January 2, 1948, Franklin, Simpson County, KY, https://www.familysearch.org/ark:/61903/1:1:Q2D4-VWBQ. 7411. “Obituary,” Ralph N Harden, The San Diego Union Tribune, San Diego, CA, November 16, 2005. 7412. “Obituary,” William D Harden, The Indianapolis Star, Indianapolis, IN, December 2, 2010. 7413. “Luther L Briley,” Find-A-Grave, https://www.findagrave.com/memorial/35700664, 35700664. 7414. “Ora Lee Briley,” Find-A-Grave, https://www.findagrave.com/memorial/35700850, 35700850. 7415. “Harold W “Bud” Briley,” Find-A-Grave, https://www.findagrave.com/memorial/164965292, 164965292. 7416. “Margaret M Briley Carver,” Find-A-Grave, https://www.findagrave.com/memorial/41890794, 41890794. 7417. “Obituaries,” Margaret M. Briley Carver, The Daily Journal, Franklin, IN, September 23, 2000, 5. Margaret M. (Briley) Carver, 78, died Friday, Sept. 22, 2000, in Greenwood. She was a resident of Indianapolis. She was born March 4, 1922, in Portland, Tenn. Her parents were Albert and Eva Pearl (Suttle) Briley. Survivors include a son, W. Wayne Derby of Indianapolis; two brothers, Bill Briley of Indianapolis and Harold Briley of Portland, Tenn.; three grandchildren; and eight great-grandchildren. She was preceded in death by two brothers, Charles and J.T. Briley. She was employed for 15 years by Scholarship Fund Division for State of Indiana as a clerk, retiring in 1983. She was previously employed by Indianapolis Police Department as a jail matron. She was a member of Calvary Tabernacle of Indianapolis, VFW Ernie Pyle Post and Moose Lodge 17. A service will be conducted at 1 p.m. Monday at G.H. Herrmann Madison Avenue Funeral Home. Friends may call from 4 to 8 p.m. Sunday at the funeral home. Burial will be at New Crown Cemetery in Indianapolis. 7418. 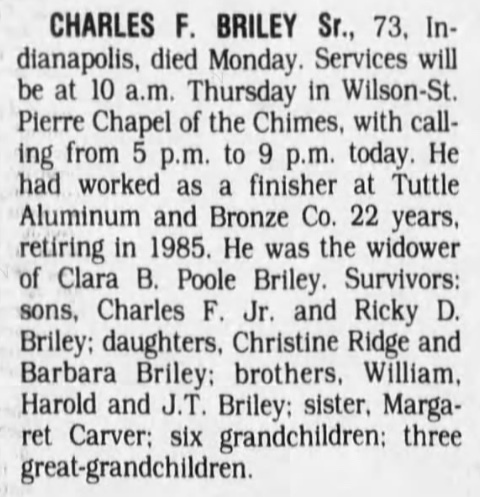 “Obituaries,” Charles F. Briley, Sr., The Indianapolis Star, Indianapolis, IN, March 3, 1993, 10. CHARLES F. BRILEY Sr., 73, Indianapolis, died Monday. Services will be at 10 a.m. Thursday in Wilson-St. Pierre Chapel of the Chimes, with calling from 5 p.m. to 9 p.m. today. He had worked as a finisher at Tuttle Aluminum and Bronze Co. 22 years, retiring In 1985. He was the widower of Clara B. Poole Briley. Survivors: sons, Charles F. Jr. and Ricky D. Briley; daughters, Christine Ridge and Barbara Briley; brothers, William, Harold and J.T. Briley; sister, Margaret Carver; six grandchildren; three great-grandchildren. 7419. Theodore E Wall and Betty C Lindblom, “California Divorce Index, 1966-1984,” March 1973, Orange, CA, https://www.familysearch.org/ark:/61903/1:1:VPTL-SQ3. Theodore Edwin Wall was born at home in Turlock, CA on October 24, 1921. After graduating from Turlock High School in 1938, he attended the University of California, Berkeley where he earned a Master’s Degree in History in 1945. He earned a Bachelor of Divinity degree in 1946 at Drew University and became a minister at a Swedish Methodist Church. This is where he met and married Betty C. Lindblom. He joined the Methodist California-Nevada Conference and served at St. Paul’s Methodist Church in South San Francisco from 1955- 1959, concluding his ministry at Madera United Methodist Church in 1968. In 1969, he was hired to teach Philosophy and World Religions at Orange Coast College in Costa Mesa and enjoyed a wonderful career spanning 39 years as a beloved professor. He married Shirley Corley in 1984 and moved to Laguna Beach, where he spent many happy years with Shirley and both families. In 2007 he was diagnosed with cancer of the bone marrow. He fought bravely, but on June 14, 2008 lost his battle to cancer and died peacefully in his sleep. He will be greatly missed by his loving wife Shirley, his children Aletha, Steve, and Carolyn and his grandchildren Megan, Michael, Sam and Grace as well as Shirley’s children Christine, Stephen and Susan and grandchildren Amy, John Paul, Kevin, William and Robbie. In lieu of flowers, the family requests donations in Ted’s memory to: Orange County Foundation for Student Scholarship Wall Memorial Fund. Donations should be sent to Orange Coast College 2701 Fairview Rd. Costa Mesa, CA 92628-5005. 7421. “Adolf H Hanson,” Find-A-Grave, https://www.findagrave.com/memorial/182875756, 182875756. 7422. “Obituaries,” Ella L DeBord, Victoria Advocate, Victoria, TX, November 9, 1996, 14. PORT LAVACA — Ella L. DeBord, 78, of Port Lavaca died Thursday, Nov. 7,1996. She was born July 1, 1918, in Olivia Community to the late Charles Emil and Ellen Catherine Cavallin Peterson. She was a homemaker and was a member of Church of Christ. Survivors: daughters, Gwen Crocker of Clute, Karen Shaver of Portland and Dorothy Coleman of Whitehouse; sons, Donald DeBord of Olivia, Thomas DeBord of Houston and Walter DeBord of DeRidder, La. ; sister, Ida Griffith of Olivia; 10 grandchildren; and six great-grandchildren. Preceded in death by: husband, Willis A. DeBord; sisters, Ethel Abraham, Catherine Burke, Bertha Oehlert and Ruth Taylor; and brothers, Emil Peterson, Oscar "Alvin" Peterson and Glenn Peterson. Services will be held at 3 p.m. today at Church of Christ in Point Comfort with Bob Crawford officiateing. Burial will be at Olivia Community Cemetery near Port Lavaca. Richardson Funeral Home, Port Lavaca, 552-2388. Pallbearers: James Griffith, K.W. Abraham, David Peterson, Kenneth Peterson, Paul Abraham and Robert Peterson. Memorials: Church of Christ, Point Comfort or Olivia Community Cemetery Association, Rt 3, Box 125, Port Lavaca 77979. 7423. “Ida Magnolia Peterson Griffith,” Find-A-Grave, https://www.findagrave.com/memorial/51563995, 51563995. 7424. “Louie Berton Griffith,” Find-A-Grave, https://www.findagrave.com/memorial/51564090, 51564090. 7425. “Leslie Burton Griffith,” Find-A-Grave, https://www.findagrave.com/memorial/51563872, 51563872. 7426. “James Randolph Griffith,” Find-A-Grave, https://www.findagrave.com/memorial/51563742, 51563742. 7427. “Oscar Alvin Peterson,” Find-A-Grave, https://www.findagrave.com/memorial/51563268, 51563268. 7429. “David Alvin Peterson,” Find-A-Grave, https://www.findagrave.com/memorial/60279253, 60279253. 7430. “Roberta Grace Peterson Barrier,” Find-A-Grave, https://www.findagrave.com/memorial/68114670, 68114670. 7431. “Walter Earl “Sonny” Barrier,” Find-A-Grave, https://www.findagrave.com/memorial/51563145, 51563145. 7432. “Ethel C Peterson Abraham,” Find-A-Grave, https://www.findagrave.com/memorial/51605307, 51605307. 7433. “Albert E Abraham,” Find-A-Grave, https://www.findagrave.com/memorial/51605183, 51605183. 7434. “Jo Ann Christine Abraham,” Find-A-Grave, https://www.findagrave.com/memorial/51605403, 51605403. 7435. “Catherine M Peterson Burke,” Find-A-Grave, https://www.findagrave.com/memorial/51521168, 51521168. 7436. “Edward Francis Burke, Jr,” Find-A-Grave, https://www.findagrave.com/memorial/51521245, 51521245. 7437. “Bertha J Oehlert,” Find-A-Grave, https://www.findagrave.com/memorial/14299266, 14299266. 7438. “Glenn A Peterson,” Find-A-Grave, https://www.findagrave.com/memorial/51606570, 51606570. 7439. “Ruth E Peterson Taylor,” Find-A-Grave, https://www.findagrave.com/memorial/58256854, 58256854. 7440. “Cloyd Veron Taylor,” Find-A-Grave, https://www.findagrave.com/memorial/58256497, 58256497. 7441. 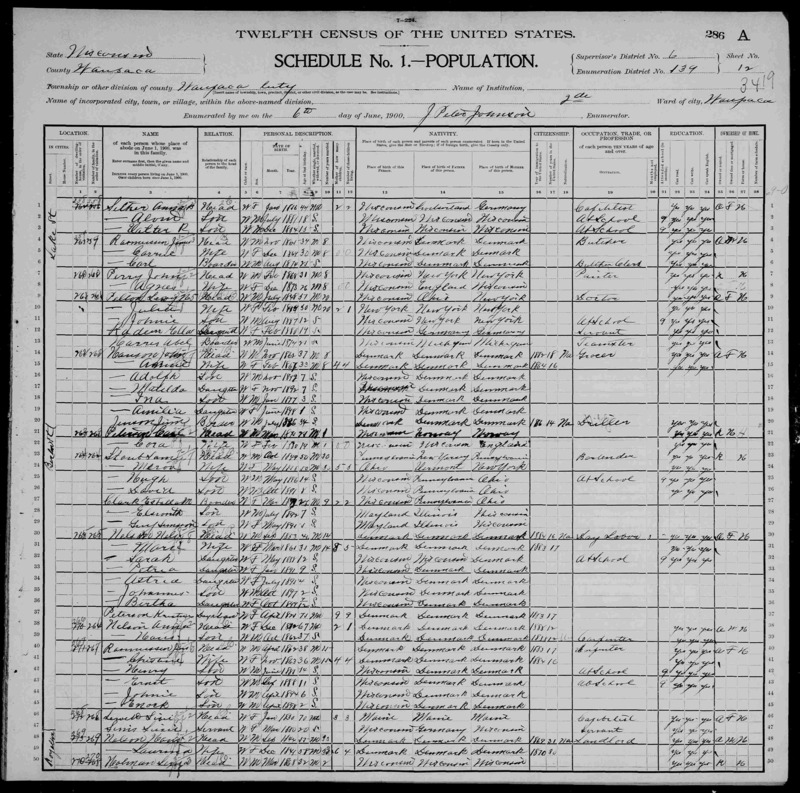 “United States Census,” 1900, WI, Waupaca, Waupaca, 2nd Ward, 12A, 6, 139, T623, 1823, Bureau of the Census, US Dept. of Commerce, United States of America, June 6, 1900, J Peter Johnson. 7442. 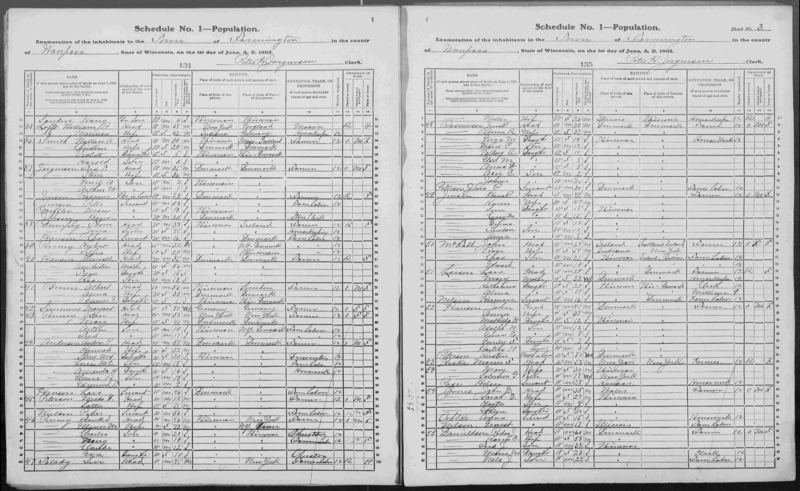 Wisconsin Births and Christenings, 1826-1926, “Hansen,” June 23, 1898, Waupaca County, WI, https://www.familysearch.org/ark:/61903/1:1:XR2G-FQN. 7443. 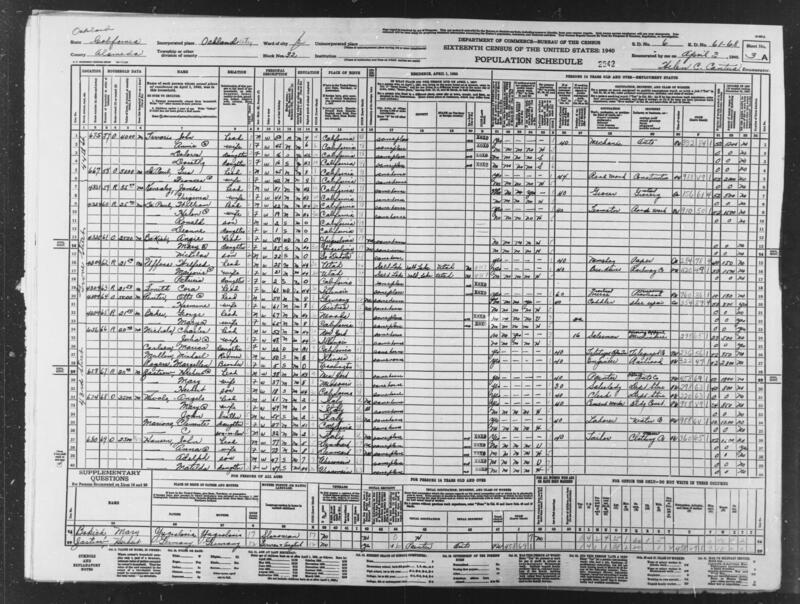 Wisconsin Births and Christenings, 1826-1926, “Hansen,” November 8, 1892, Waupaca County, WI, https://www.familysearch.org/ark:/61903/1:1:XR2Y-W2Z. 7444. Johannes Hansen and Anna W Petersen, “Wisconsin, County Marriages, 1836-1911,” November 20, 1891, Waupaca, Waupaca County, WI, https://www.familysearch.org/ark:/61903/1:1:XR2Q-HZW. 7445. “Wisconsin State Census,” 1905, WI, Waupaca, Farmington, 3, 135, 3, State Historical Society, Madison, June 1, 1905, Peter H. Jorgenson. 7446. “United States Census,” 1940, CA, Alameda, Oakland, Ward 2, 3A, 6, 61-68, T627, 442, 45, Bureau of the Census, US Dept. of Commerce, United States of America, April 3, 1940, Helen C Cantua. 7447. “Theodora E Laske,” Find-A-Grave, https://www.findagrave.com/memorial/179838941, 179838941. 7448. “Herbert A Laske,” Find-A-Grave, https://www.findagrave.com/memorial/179839027, 179839027. 7449. Herbert A Laske and Theodora Hansen, “Michigan Marriages, 1868-1925,” August 28, 1920, Menominee, Menominee County, MI, https://www.familysearch.org/ark:/61903/1:1:N3BG-PDK. 7450. Chad Sokol, “Coeur d’Alene police identify couple killed in apparent murder-suicide,” http://www.spokesman.com/stories/2017/jun/05/coeur...uple-killed-in-appa/, June 5, 2017.